I said in my last post that I was working on more Nurgle models. 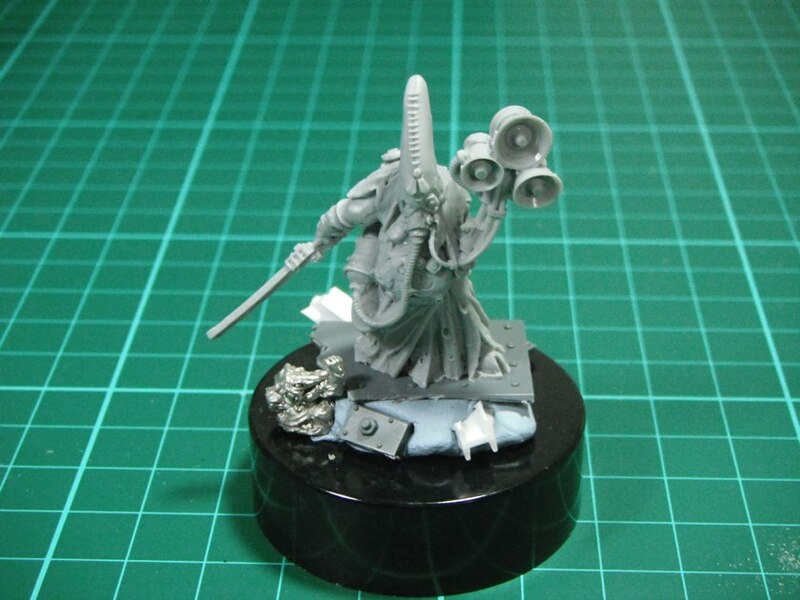 These are the Tainted, a Chaos Space Marine warband described in Imperial Armour Vol. 7. They were one of the warbands that took part in the siege of Vraks.I really like the idea of having an army made up of different warbands who worship the same god. Also, it helps my regular Chaos marines stand out from the Plague Marines. I went with a quick and dirty paint job on these in order to match my Death Guard. This was achieved through drybrushing, sponging and a wash with oil paint . Obviously these are still work in progress and need weapons and backpacks adding. Some of you may have seen my Death Guard army from a few years ago. Well, while reorganising my study in order to accommodate some books I moved out of my old office I discovered this Blight Drone at the back of a shelf. The model was painted quite some time ago but I’d never finished the base. A quick bit of drybrushing and the addition of some basing materials soon sorted this out. Now that the model is 100% complete I thought I would photograph it and show it off on the blog. 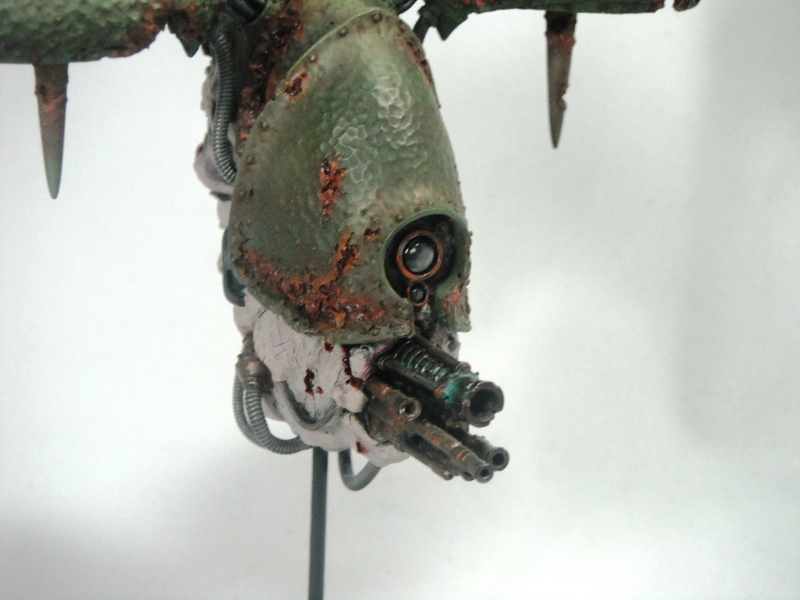 Finding the Blight Drone has inspired me to paint some more Nurgle models. Keep an eye on the blog for these in the near future. 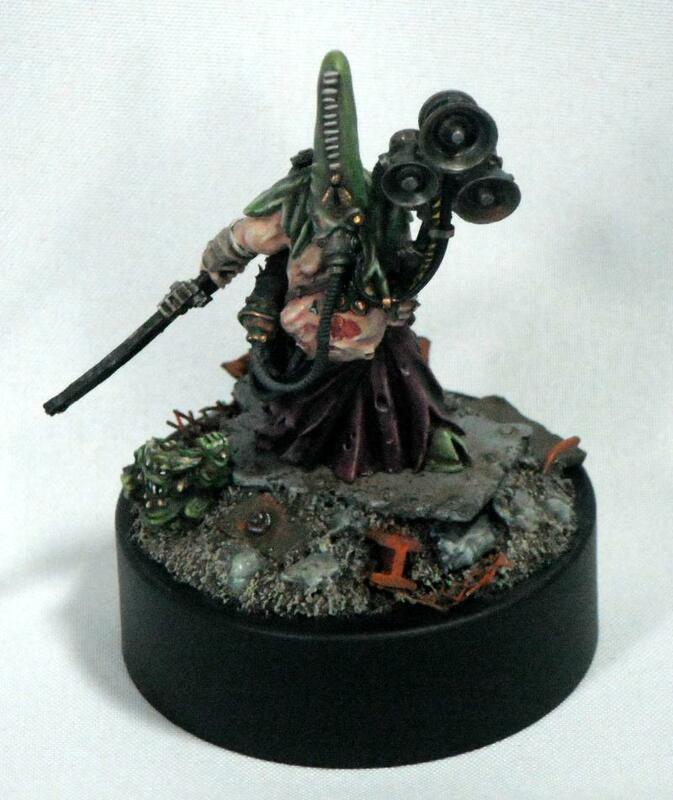 I’ve finished my apostate preacher of Nurgle from Forge World. 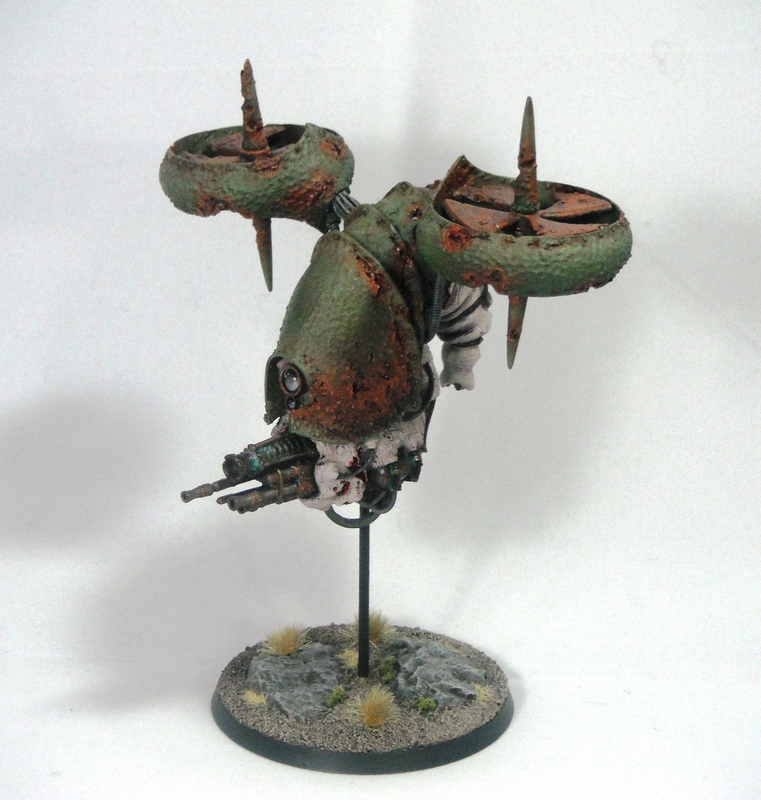 As I mention in an earlier post, I experimented with glazes on this model. The green cloth was glazed with Liche Purple in the recesses in order to help define the shading and to ensure that the green worked with the purple robes tonally. I also used Seraphim Sepia glazes on the green to put back some of the warmth that was lost through highlighting. 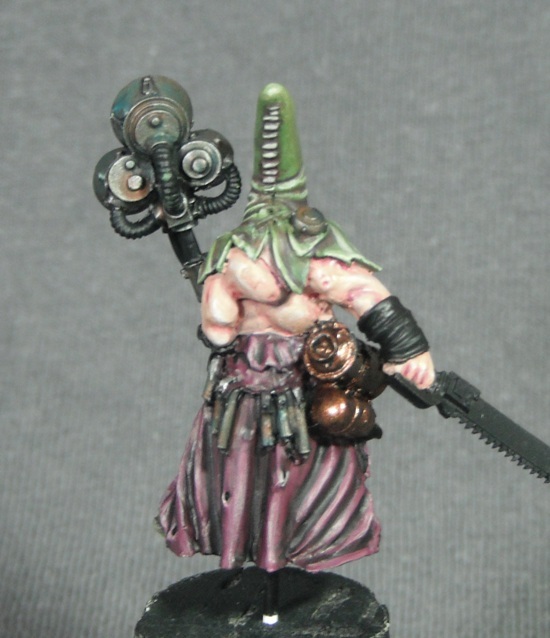 Similarly the flesh was glazed with reds and purples to help tie the different areas of the model together and to provide an unhealthy and suitably Nurgley appearance to the skin. The metal areas also had glazes of brown, green and turquoise applied randomly in order to give a tarnished feel and introduce a little interest to the metal. All of the glazes were made by mixing Citadel paints or washes/shades with Lahmian Medium which gives great control over the glaze. The idea is to use an almost transparent glaze and to build up the colour with several applications rather than one heavy one. The scenic base was also great fun to do and I think it really adds to the mood of the piece by giving the character a setting and complementing the final look of the model. 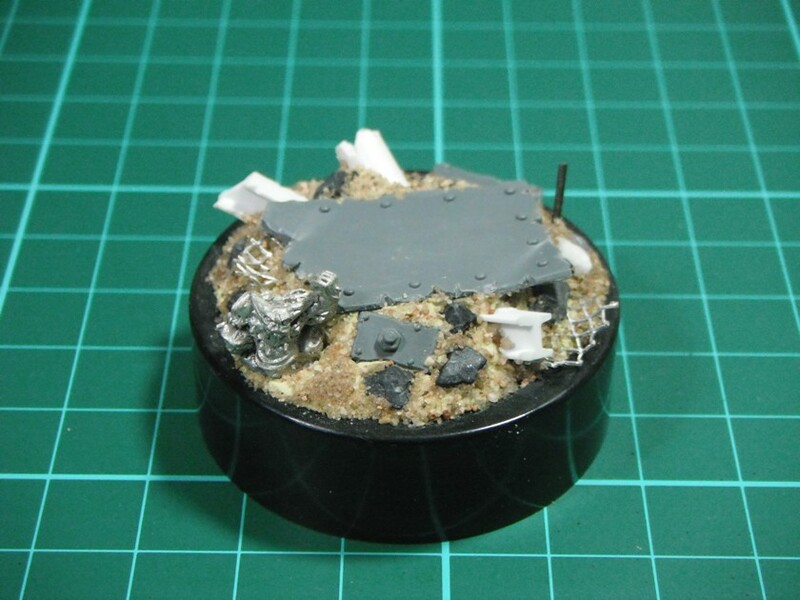 This was made from a jar lid (in this case from a M&S spice jar which make great bases for 28mm models) following the same method as I used for my ork. Of course, I had to add the obligatory Nurgling. 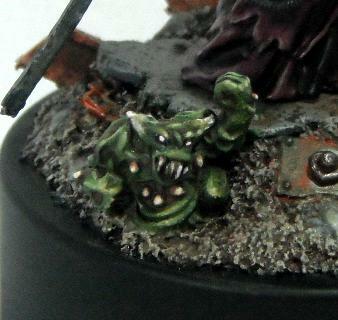 This guy is one of the old Trish Morrison designed Nurglings from the ’90s which I think are still among the best. They are such brilliant, characterful little models which combine just the right amount of comedy and menace. As always I’d love to hear what you think. My apostate preacher is now nearly finished. However, I’m going to hold off showing him until he is completed so as not to spoil the finished effect. Also, I don’t think that a work in progress shot at this stage would give you anything that the finished model won’t. Instead here is the scenic base I constructed for him. The preacher has taken me longer to paint than anticipated. The reason for this is that I was lucky enough to win a copy of Dark Vengeance in a competition on Twitter and I ended up getting sidetracked and painting up some Dark Angels which I hope to show you in the near future. 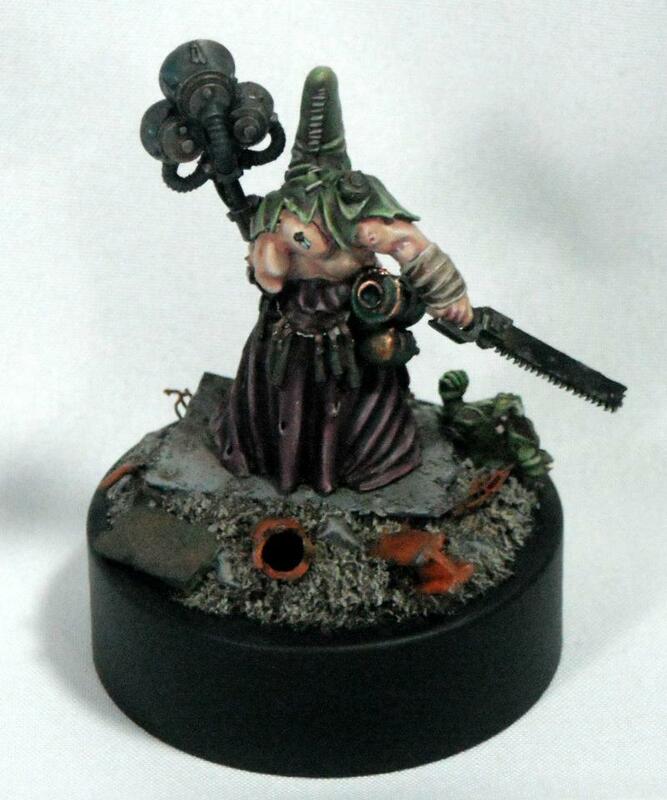 A quick work-in-progress shot of the Nurgle preacher. I’m experimenting with glazes and glaze medium on the skin and metallic areas but I’ll do a more detailed write-up when the model is finished. 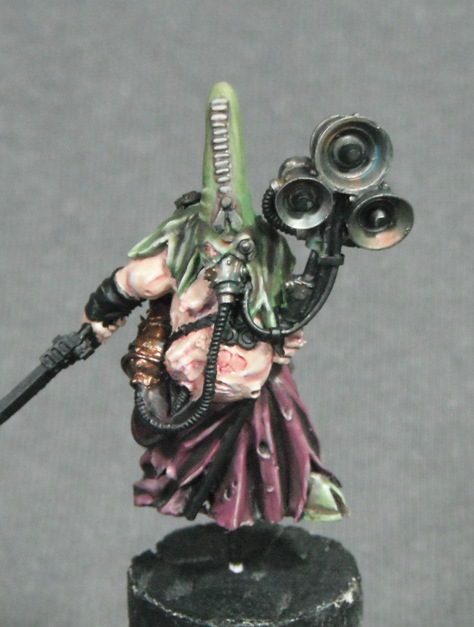 A quick preview of my next project, one of Forge World’s apostate preachers of Nurgle from their chaos Renegades range. I’ve had this model for ages but never got round to painting him. This should keep me busy over the weekend.